I’ve pretty much determined that I stink at running a book club. To be better at managing this book club I would need to do a close reading of the chosen book. I have been just plain reading the book, but that’s not good enough to be an excellent book club leader. Truth is that I don’t have time to do a thorough analysis of various books. I barely have time to read all of my email. I’ve decided that it’s better for me to focus on the core aspects of running this blog, which include actual blogging, reading email, tweeting and facebooking. As you can tell by the dimensions, it is on the smaller side. The outside is black, but the inside is teal. It’s a lovely bag! To enter leave a comment on this post about Fast Food Nation. I’ll chose a winner randomly and announce it next Friday! Fast Food Nation is a book. That’s ok Mrs Q, it was a good effort and it’s good that you have decided to focus on other areas of this blog. I’m sure you are busy plenty busy at home and with running this blog. No need to attempt leading a book club if you don’t have the time for it! Thanks for being honest about it and have yourself a great weekend! The most interesting part of the book was definitely the last couple of sections, focusing on the slaughterhouses. So hard to read, but so eye-opening. Fast Food Nation forever changed the way I look at fast food. I used to just avoid the meat (the obvious icky), but after reading Fast Food Nation, I cut out fries and soft drinks too! I haven’t darkened the door of a fast food restaurant since! I had known some of this information before but after reading Fast Food Nation and seeing it all together it strengthened my resolve to change our eating habits. We had gotten to the point that we pretty much avoided fast food unless we are on the road. The past couple of car trips we have taken I have planned ahead and packed food so that we could easily stop and have a picnic instead. Thanks for recommending this book. I think that this books is this generations version of The Jungle by Upton Sinclair. But without the severe political undertones. It just hasn’t had the same effect on the food industry. I had to read this book for a geography class in college I finished reading it before the semester started because I wanted to know why it was required reading for the class. I didn’t read it with you this time because I’ve read it twice before…I still eat at McDonald’s though I hate it. And I only get fries there now…I don’t love the What Happened to the Potato Industry story but it bothers me way less than the What You Are Really Ingesting in a McNugget or Burger story. 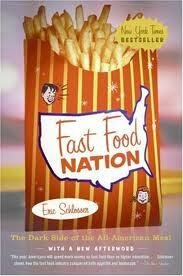 Fast Food Nation changed the way we look at food as well as our eating habits. Knowlege is power but it’s also sometimes discouraging. I thought it was extremely fascinating that now almost everything we eat is now corn-based. I’ve never been a fast-food person, however I did occasionally pick up a few processed food items from major companies every now and then, but now no more. Nothing has quite justified the extra cost of organic and free-range groceries for me quite like this book. An extremely well written book that makes you think about the food your eating. After reading this book, I definitely haven’t been able to look at certain things that I used to eat on a regular basis. This book really changed the way we look at fast food! We’re not big fast food people, but now, the rare times we go, we’re much more selective. More of the salads and healthy offerings, less of the chicken nuggets and Big Macs. It’s kind of funny to watch my well-informed 7-year-old spout off the evils of the Happy Meal – we’re definitely shaping the next generation. I think that fast food is….fast food. You get it because you’re lazy or out of time and our stupid brains process the convenience of the fast food place close by and we just….go. My hubby is a trucker. He eats at fast food places all the time. Why? Because they line the roads. They’re all that’s out there for people on the go, miles from home. Would we eat at a fast-fod place that was 100% organic, and only offered fresh veggies and fruits and water and grilled chicken and turkey and lamb and wheat pasta? Would we? I was surprised at the labor practices just as much as I was by the food ingredients. I just can’t get behind companies that strive to keep their workers sick, hurt, and in poverty (not to mention vulnerable to robberies) for the sole purpose of CEO profits, especially when the product they put out is so inferior and filled with infectious disease. I really see no benefit to the industry, and I just can’t support it unless they change their entire business model. Adding a few salads to the menu is not enough. You won the lunch bag! Please email me your address so I can mail it off to you! I found the food processing sections of the book (beef and potatoes) to be the most eye opening. We already avoid fast food as much as possible, but Fast Food Nation certainly offers greater motivation to continue to avoid fast food. In response to Lacey’s question about whether I would stop to eat salad, fruit and grilled chicken if I was traveling, I reply: yes. I have an array of food allergies and would greatly appreciate more ‘simple’ basic foods being served so I could easily eat anywhere without the worry. Plain fruit, veggies and meat taste good to me. I know I may not be in the majority, but I think a growing minority of people would appreciate organic, simple, healthy meals being available at more restaurant locations. I was once one of those underpaid teenage workers, slaving away for no money and causing me to slip behind in school, when I should have been concentrating on my education. Instead, I was up at 4:30 to be at the fast food place to serve breakfast by 5:30, then working until 4!!!! Crazy… I loved this book because every single bit of it is so close to home for me. I am one of those people who often rely on convenience food because it’s such an easy alternative. There are only 2 in my household, and so very often, I spend WAAAY more cooking a meal, when it’s so easy to run out and buy something from the $1 menu at the local fast food place. What it is doing to my body is very scary though. The processed foods are not only very bad for you, they are actually addictive. I read this book for a college class and it really made me open my eyes to what this society has come to – it goes in circles too – more unhealthy people leads to more money for the health care/health insurance companies. I seriously couldn’t get through the whole book. I just made me sick to read it. We stopped eating fast food a couple years ago. It’s been one of the best things that we’ve done. If I have to stop for something quick, I’m much more likely to stop at a market with a deli. When I read FFN about a year after it came out, I stopped eating fast food altogether for about a year. I have a friend who still won’t eat chicken. I gradually fell back into fast food because it was just easier when we were traveling with small children. More than the food, I needed a clean bathroom, and the Golden Arches supplied milk and apples to boot. Our children are a little older now, and my husband and I are recommitted to avoiding fast food whenever possible. My daughter is reading this book as part of a food sociology course that she is taking this summer in Pisciotta, Italy. I read it when it first came out. About 8 months ago I decided to stop eating fast food so regularly for health reasons; I knew–though not why in such detail–that fast food was bad for me. Now…I do my best when out with less enlightened friends or family to speak up and make sure we don’t go to those places. Usually it’s something innocuous like “I really don’t want something greasy, can we go to _____ instead?” And usually it works. In the last 8 months I’ve only had the displeasure of visiting the Golden Arches once, but only because there really was no other food option and I was extremely hungry. I do wish there were more fast healthy food options available. I’ve read Upton Sinclair’s “The Jungle” and quite enjoyed it, as well as this book. I can see the comparisons. I hope more people will pick up this book; if they did, I think it just might make the same impact on the food industry. It was definitely interesting to read. This book has been around long enough that the information in it wasn’t new to me. I eat very limited fast food as part of my generally healthy diet but it’s important to know what’s available because it’s possible to get stuck somewhere where the food options are extremely limited and carrying one’s own food is impractical. There are a few fast foods available that I know I can eat in an emergency. Reading books like this and Michael Pollan’s books can be helpful for this.